Back at base camp again after three days on the mountain, including a night at Camp 2 (7100m), the highest I’ve ever slept. We started out for Camp 1 on Monday morning (20th). As usual the weather started clear, but this time it stayed clear almost all the way to camp, so for the first time as we slogged up the steep scree slope we had clear views of the route above us to the summit, as well as fantastic views behind across the rugged rocky skyline of Tibet and the northern Himalayas. 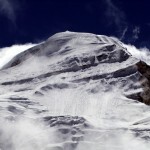 There has been a lot of snow on Cho Oyu over the last week or two. The rock band beneath the summit dome is still clearly visible, but the chances are high that there is a route through it on snow without having to resort to the rock. In fact, we were spared all but a few minutes of snow in Camp 1 as well. Miha and Matjaz were very quiet in the tent next door to us this time. I still find it very hard to eat at high altitude, mainly because the expedition meals taste like shite (this time I forced down an ‘all day breakfast’ with no enjoyment whatsoever), but tent mate Tim continues to eat for Australia. 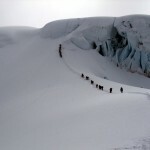 I had a great night’s sleep, however, and was feeling fresh as we set off up the snow slopes to Camp 2. We left at 7.15. Matt set quite a quick pace, and although we all kept together, some people were feeling it by the time we reached the foot of the serac wall. At this point we split up into a fast team and a slow team. Foolishly, as I’d been following close behind Matt all the way, I joined the former group, led by Tomaz, and whose only other two members were Matjaz and former Olympic rower Steve Williams. I take back what I said about the Chinese team we encountered on the serac wall a few days ago. The reason they were taking so long to climb it was likely not due to incompetence, but because the were knackered, as I soon discovered. A steep snow slope leads up to a short vertical section with a number of very high steps which are very tiring at 6800m. Above this the path turns right on slopes of around 50 to 60 degrees. This section dog-legs back to the left, but a single fixed rope spans the whole section. The first part was easy, but as soon as I felt Steve and Matjaz attach to the rope behind me, it became very tight and it was a struggle keeping to the trail against the tug of two big people on the rope behind me pulling me in the other direction. From this point on the climb became a real test of endurance, and the next 24 hours or so were not the most enjoyable I’ve ever had. Above the serac wall is a large plateau which affords some respite. We sat down to rest, eat and drink, before moving on. Above this the slopes to Camp 2 are unremittingly steep as they traverse above another wall of seracs, like pipes of a giant cathedral organ. Halfway up I’m struggling and my throat is parched. As Tomaz and Steve wait above us, Matjaz suggests I stop to take my pack off and have a drink. Immediately I feel better, but the going doesn’t get any easier. Near the top of a fixed rope section some of our sherpas pass us coming down, and Tomaz asks how far we are from Camp 2. “25 minute, 25 minute,” they say. I always wonder how Nepalis are so precise about time when none of them wear watches. “25 minutes for you, or for us?” asks Matjaz. 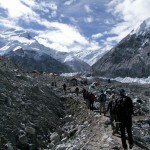 The difference between sherpas and we mere mortals on high mountains can be as much as twofold. “25 minutes up or down?” I ask still not convinced, but they assure me it’s for us going up. Of course, it takes much longer. Above the fixed ropes is another steep slog of a snow slope which goes on and on. Watching Steve ahead of me carrying his Steve-sized pack makes me feel even more tired. I let Matjaz pass me, and he promptly disappears over the horizon ahead of me. I reach Camp 2 at 1.30, exhausted and quite dehydrated. I’m still tired by the time Tim arrives at 3.30. The afternoon disappears in between snoozing and melting snow to drink. Only occasional glimpses of the summit dome 1100m above us are afforded through the cloud. The trail seems to have been obliterated by snow. I suffer a restless night’s sleep, 13 hours of it, occasionally snatching 5 minutes here and there, but mainly lying awake suffering. I drink 2 litres of water during the night, and by the morning I’m still feeling dehydrated, with a splitting headache to boot. We descend from Camp 2 in a blizzard. Many inches of fresh snow on the trail have made the steeper sections hard to negotiate, with the danger of the snow giving way beneath you a constant hazard. Beyond the plateau the going gets easier, however. I abseil down the serac wall and stroll into Camp 1 at 11.15, barely 2 hours after leaving Camp 2. 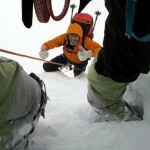 I join the athletes for the descent to base camp as the snowfall continues. Steve Williams, Richard Parks, assistant guide Matt, who is quicker than both of them, and myself. I’m still dehydrated, but base camp beckons. We reach it a little before three, where hot drinks, soup and chocolate brownies await, and I make up for the food and drink I’ve missed out on higher up. The snow continues to fall today. There has been quite a lot of it over the last few days, providing an increased risk of avalanche. Our weather forecast predicts it will end on 25th, however, and there will be a long summit window thereafter. 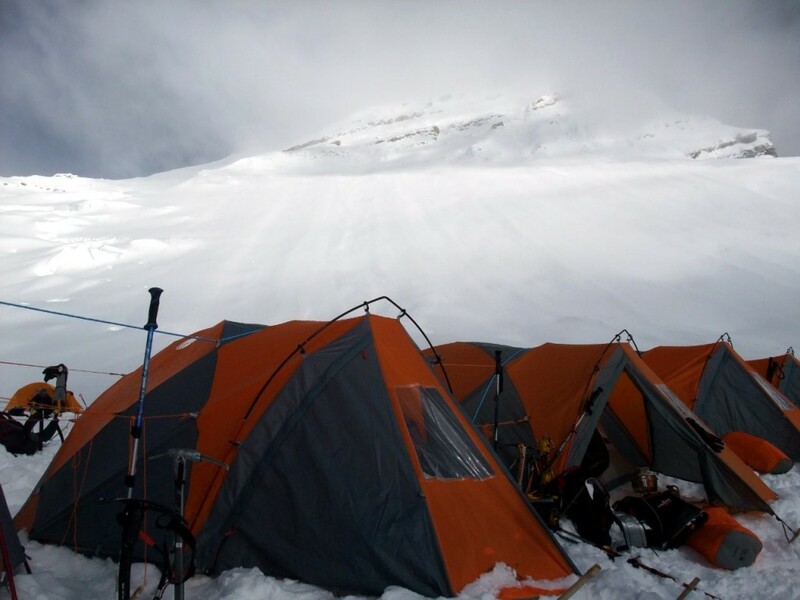 We’re probably going to spend two or three days back at base camp now, while we rest and the fresh snow consolidates. Then it will be time for our summit push on the last few days of September.